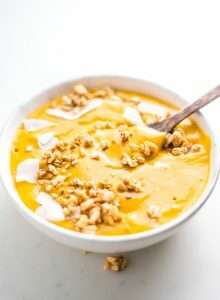 This anti-inflammatory turmeric smoothie is packed with nutrition, high in protein and has the consistency of soft-serve ice cream. Try it topped with cashews, coconut flakes and a handful of your favourite granola. Scoop it into a bowl, load it up with your favourite smoothie bowl toppings and enjoy with a spoon. This smoothie comes out very thick if you follow the recipe as written. If you prefer a drinkable smoothie, add a bit more liquid until you reach desired consistency. Topping ideas: granola, shredded coconut or toasted coconut flakes, sliced banana, almond butter, almonds, walnuts or cashews, mulberries, chopped dates or raisins.